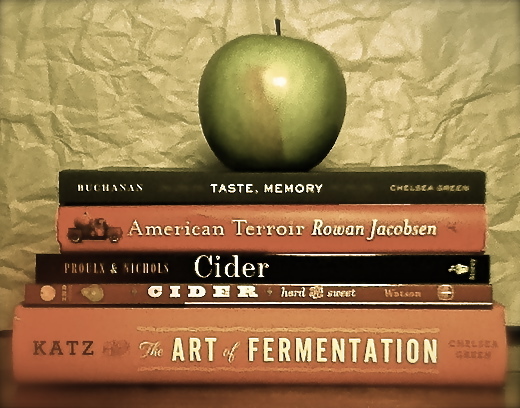 We’ve been following the writings of Maria Kennedy at Cider With Maria for some time, and were very pleasantly surprised to find ourselves seated next to her at Proletariat’s 2013 Cider Week NY tasting event with Andy Brennan of Aaron Burr Cider. 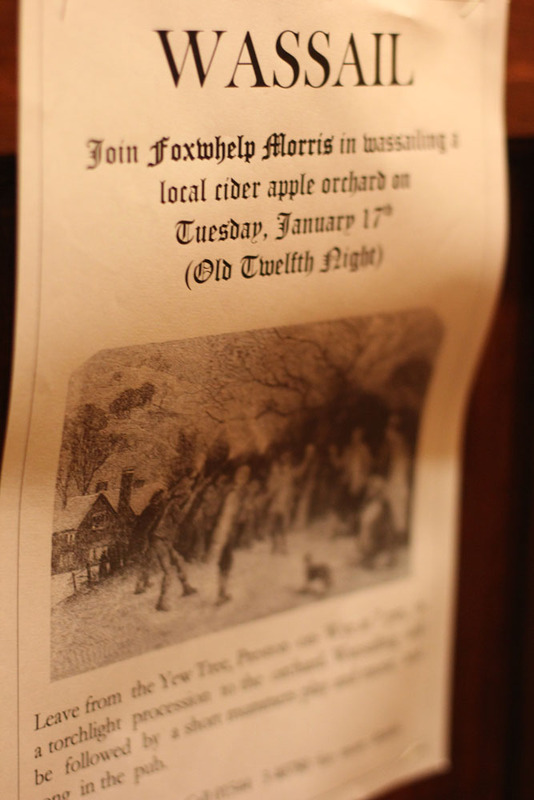 I was sitting it a pub in East Hackney, London one January night a few years ago trying to convince a young man from Portsmouth that English people did in fact practice the custom of wassail. “Wassail?” he said. “I’ve never heard of that. English people don’t do that. I don’t believe you.” I parried his aura of certainty with my own indisputable fact: I had just travelled down to a remote corner of Devonshire to participate in a wassail. I had seen it for myself. We had traipsed round a village in the Blackdown Hills singing for cider and wishing good health to the farmhouse, the garage, the old vicarage, the pub, and finally the orchard itself. English people DO wassail. The young man’s incredulity about the existence of this custom is understandable, though. With a few notable exceptions of wassail celebrations that claim to have survived unbroken into the present, such as the one at Carhampton, Somerset, the custom seems to have died out or disappeared most everywhere else, surviving only as a festive Christmas drink or an obsolete word in a carol. In the past few years, however, a notable revival has been rising, and as several of my friends in England put it, everyone seems to want to have a wassail now. So why did wassailing die out in England, and why is it being revived now? These were some of the questions I set out to answer when I first trekked out to torchlit winter processions on the twelfth night of Christmas in Devon, and later Somerset, Gloucestershire, Herefordshire, Shropshire, and Worcestershire. 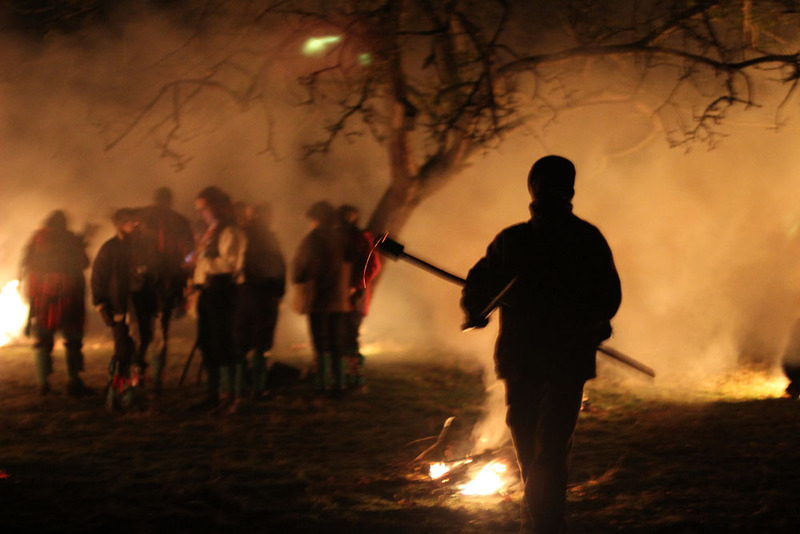 Many people think of Wassail as a remnant pagan custom, and it is easy to see why, when black-faced Morris men lead hordes of otherwise tame urbanites carrying torches through old orchards to sing to the apple trees and scare off witches with gunfire. It’s an enthusiastic performance of what some might think of as a primitive, superstitious approach to life, which might seem refreshing after the daily grind of rational civility. Being outside after the endless indoor Christmas parties feels like a release, and the bonfires and torches light up the night in a way that wakes your tired soul from the dreary sleep of midwinter. And the cider, well the cider just makes you feel sublime, a bit euphoric. The torches seem brighter. The night seems blacker. And it feels like anything is possible inside the circle of trees that almost seem alive. I think the custom’s visceral tactile appeal stems from the sensory stimulation of frost and fire and the imaginative tunnel of superstition usually silenced in a society based on scientific rationality. It’s an opportunity to get out and be a little wild for a night, and that’s what rituals and festivals are often good for, shaking up our everyday habits and injecting the mundane world with mystery and significance we don’t usually feel. Some of the people I came to know who had helped revive wassail over the last twenty years had a much less superstitious orientation to the custom, though, and their perspectives shed light on some of the social realities of rural agricultural life and highlight the enormous social changes it has undergone in the past century. Wassail, a custom historically based in rural society and food production, has something to teach us about the changing ways we work with each other, as well as the ways we interact with natural and agricultural resources. For Eric Freeman, a life-long farmer in the rural countryside of Gloucestershire, and his friends Pete Symonds, a former electrician from the Forest of Dean, and Albert Rixen, a plumber and engineer, wassail was a tribute to the work of the agricultural year and an emblem of the social contract between farmers and their agricultural workers. Pete Symonds is a skilled tradesman in a rural community whose livelihood suffered with the outsourcing of industrial work overseas. He saw in wassail the opportunity to celebrate the social bonds of working men and commemorate the cooperative nature of agricultural labor in an era before industrialization. Albert Rixen, devoted to restoring old steam engines, including antique steam powered cider equipment, also lends his workman’s approach to wassail and cider making, keeping alive the mechanical heritage of agricultural work. Eric Freeman, a tireless supporter of agriculturally-oriented social networks such as the Young Farmers and groups devoted to saving rare breeds of livestock, has dedicated much of his life to the practice of farming not just as a business or even a personal vocation, but a way of life still full of social and cultural richness. For these men, the resurrection of the custom of wassail was not about superstition at all. The considerable labor involved in preparing the bonfires and torches and orchestrating the festival mirrored the kind of labor they wanted to celebrate – shared labor, social labor, the kind of labor that was necessary to keep a pre-industrial farm going. This is the kind of labor that makes work worthwhile, and which seems to be slipping away in a world of global markets, where labor is outsourced, rural communities are left slowly crumbling, and agriculture produces commodities instead of food. It’s also important to remember that the social contract didn’t always work, that standards of living for agricultural workers in the pre-industrial era were generally dire. But wassail was a moment when the contract was tested, when the workers held the orchard and the farm hostage for a night, demanding food and drink from their employers in return for performing the wassail and ensuring a fertile crop in the year to come. Superstition becomes bare social reality here, because without a satisfied workforce, the farm could not be productive. Without workers, there would be no harvest, no fertility. Wassail was a kind of symbolic labor negotiation, with the potential harvest hanging in the balance. And the next Monday after twelfth night, known as Plough Monday, work started again. The fields were ploughed for the coming year. 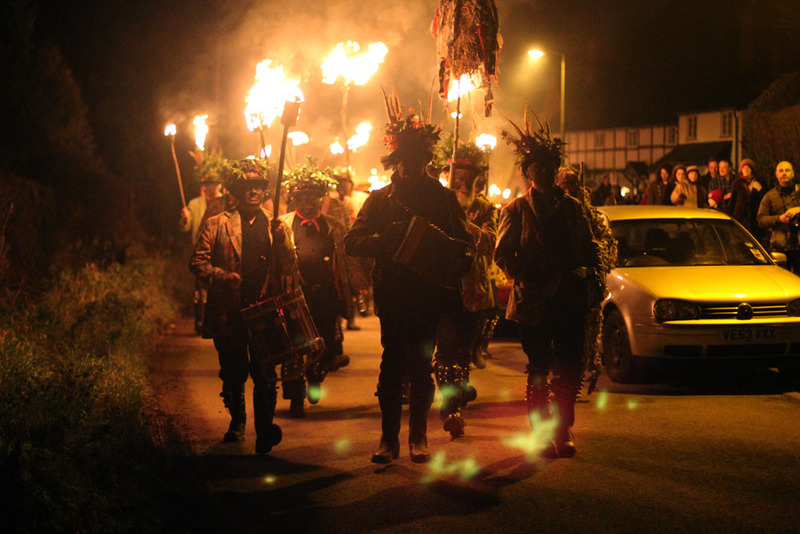 It all seems a bit serious for a rowdy evening of cider drinking, morris dancing, and bonfire lighting. And don’t get me wrong, sometimes of the most obvious reasons to join in a wassail is simply for a good prank, a good drink, and an excuse to dress up in funny costumes and indulge in a little pyromania. 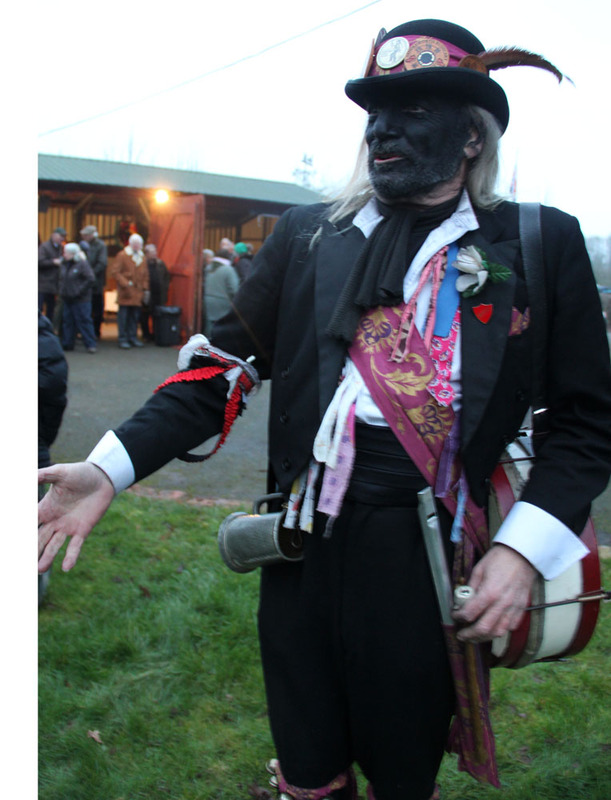 But the interplay of superstition, social history, and a walloping good time is what makes wassail a tradition with depth and complexity that can appeal to people on many levels, even as they face adapting to economic, social, and environmental change in their communities. 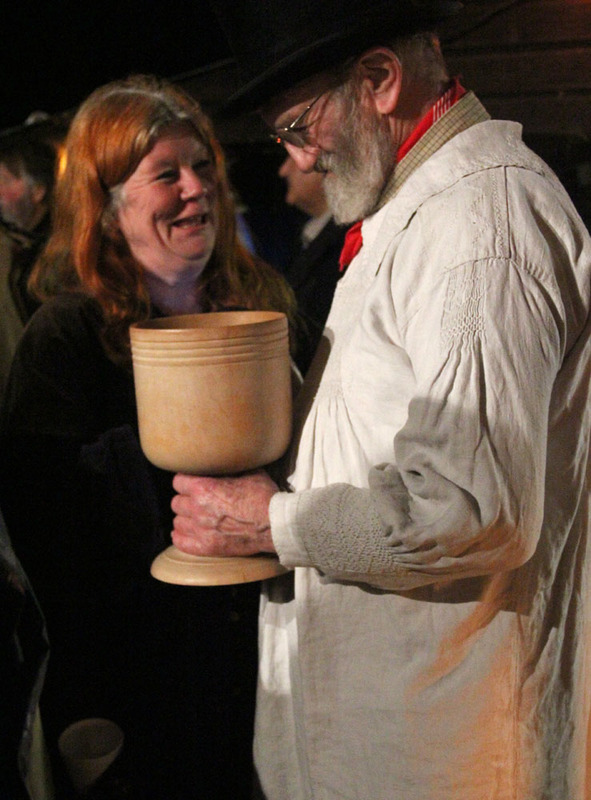 Wassail: An Unexpected Revival all content and photographs copyright Maria Kennedy. Oh, Ithaca! A Very Moist City. 1921. Federal Inspector Lays Down Law to Makers of the Beverage. Official Claims More Liquor Here Than in Other Towns of Same Size. Cannot Be Manufactured Without Having Bonds and Taking Legal Steps. “There Is more liquor in Ithaca than in any other city of its size in New York State, according to a statement made by the federal director,” declared Jay Carpenter when he returned yesterday afternoon from a short trip to Syracuse. Mr. Carpenter, who was accompanied by E. J. Holmes, said that they had received instructions from the “district prohibition agent that neither they nor any other cider manufacturers in Tompkins county would be permitted to make any more cider unless they first obtained a federal permit and then gave a guarantee that the cider would never become sour. The official also informed his visitors that the federal agents have Ithaca in mind for another visit in the near future. It Is understood the interest of the federal enforcement bureau was drawn to Ithaca due to the large sales of hard cider which have been made in this city. Mr. Holmes and Mr. Carpenter, both of whom manufacture clder on an extensive scale, were cited to appear before the federal director in ‘Syracuse on Thursday. They were ‘ Turned that they had no right to manufacture cider without a permit and that if they obtain a permit they must absolutely guarantee that the cider would not turn sour. Mr. Carpenter maintained that, although his cider is pasteurized before it is sold, he cannot guarantee it will not become sour. The federal director informed the Itathacans that they could obtain permission to manufacture vinegar by filing a $2,000 bond and taking other necessary legal steps.